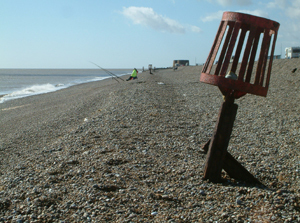 Aldeburgh is another of those East Anglian towns which has lost land to the sea over many years. Walking along the seafront today, the Moot Hall is a prominent feature. In the middle of the 16th century it stood in the centre of the town and now is just behind the beach! In Tudor times, Aldeburgh's economy was based on the sea. As well as fishing, shipbuilding was an important local industry. Two of Sir Francis Drake's ships are recorded as being built at Aldeburgh, Greyhound and Pelican - the latter renamed on his voyage around the world to Golden Hind. 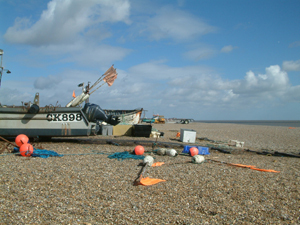 At that time Aldeburgh could be classified as a port, with its maritime trade facing the river Alde. The silting of the river then prevented larger vessels entering the estuary, and Aldeburgh lived from its fishing. 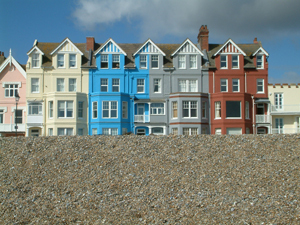 Mid-eighteenth century Aldeburgh is described as "... a poor and wretched place, with nothing of the elegance and gaiety which have sprung up about it, in consequence of the resort of watering parties. The town lies betweeen a low hill or cliff, on which only the old church and a few better house were then situated, and the beach of the the German Ocean. It consisted of two parallel and unpaved streets, running between mean and scrambling house, the abodes of seafaring men, pilots and fishers." Not very flattering comments from the Reverend George Crabbe in a biography of his father, the poet George Crabbe. George Crabbe was born in Aldeburgh in 1754. On the seaward side, as land was lost, new buildings were erected on higher ground behind the town. This led to the building of the 'Town Steps', a feature of the town today. Another walk in town is along the 'Crag Path', what would be known in many seaside resorts as 'the promenade'. Lookouts from earlier days, when salvage and piloting was an important form of income, stand at the top of the beach. Fishermen's huts and boats ready for sea are at the top of the shingle. Along the beach, and perhaps more particularly to the south, beach fishermen try their luck. Beyond the 'Crag Path' the walk continues towards the Martello tower, a relic from the defences erected against the threat of a Napoleonic invasion. A few hundred metres to the north of the 'Crag Path' is the interesting, not to say controversial, scallop sculpture by Maggie Hambling. The fortunes of the town began to improve as the fashion for visiting the seaside grew in the early 19th century. The health-giving properties of the sea seems to have brought a good class of visitor - in the sense that they had money to spend - to the town. Bathing machines were established on the beach. The Marquess of Salisbury has a summer residence built on the cliff top, one of several fine Georgian and Victorian buildings that would be erected. However, the sea continued to menace the estuary and town. A high mud wall protecting the southern end of the town and the marshes was topped by the sea in the 19th century, a precursor to the great flood of 1953, when Aldeburgh suffered along with many other low-lying east coast towns. The coming of the railway in 1860 was another boost to the town. Constructed primarily to serve Leiston and Garrett's Engineering Works there, it boosted the local fishing indusrty as catches could now speedily reach the London markets. Conversely, the railway brought visitors, and in partiuclar the excursionists. 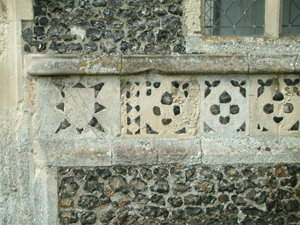 Aldeburgh's church of St Peter and St Paul, with a traditional East Anglian flint build, stand on raised land back from the seafront. As with many churches of the region, there is later restoration, but it retains a 14th century tower. Amongst its other features are a bust of George Crabbe and a stained glass window showing the three Britten parables of the Curlew River. Another famous resident of the town was Dr Elizabeth Garrett Anderson, the first woman in Britain to be qualified as a doctor. Born in 1860, she resolved to study medicine and after many difficulties and much resistance, she became general medical attendant at St Mary's Dispensary in London. Later in her life she became Mayor of Aldeburgh, the first female mayor in Britain. As well as the fishing boats, today with powerful outboard engines, Aldeburgh retains its offshore lifeboat, launched from a carriage pushed down the beach by tractor. For many years the lifeboat stood out in the open, but it is now housed in a purpose build building at the top of the beach. Aldeburgh also has an inshore lifeboat, for small boat incidents and swimmers in difficulty near the shore. 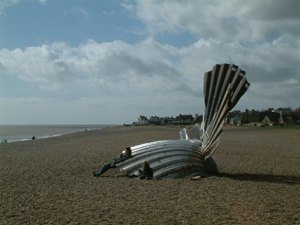 Aldeburgh is well-known today as - to quote the Festival web site - "a place of inspiration and energy for music and the arts." The annual Aldeburgh festival and the many other events at the Snape Maltings and other venues, are the heritage of composer Benjamin Britten and tenor Peter Pears, long time residents of Aldeburgh. Britten's association with Aldeburgh is perhaps epitomised in his opera Peter Grimes, based on the fisherman of George Crabbe's poem.